Architect Joseph Lyman Silsbee designed this elegant 1888 Lincoln Park building, nicknamed the Carlson Cottage, as a ladies comfort station. This fall, I will present Chicago Parkitecture, a four-part seminar at the Newberry Library, which explores the fascinating evolution of buildings and structures in Chicago’s parks. From Victorian refectories and conservatories to the world’s first field houses to Art Deco bridges on Lake Shore Drive, the city’s parks possess a remarkable collection of historic architecture. The seminar will be held on Wednesday evenings from September 27 through October 18. For more information or to register visit the Newberry Library web site. In honor of this seminar, let me share a few highlights. Built in 1880, Burnham & Root’s Washington Park Stables, known as the Round House, is being rehabilitated as an annex for the Du Sable Museum. Chicago’s seminal park and boulevards were conceived in 1869 as a continuous stretch of green to encircle the city. Ambitious landscape plans were produced for the ribbon of six parks that became known as Lincoln, Humboldt, Garfield, Douglas, Washington and Jackson Parks. With swampy natural sites and inadequate funds, improvements occurred slowly, and in phases. However, by the late 1870s and early 1880s, some of the city’s first park structures were underway. Many of the early park buildings had utilitarian purposes, such as stables, or bathroom buildings, often called comfort stations. Jenney’s Garfield Park Stables, erected in 1890, served as a maintenance building until it was destroyed by fire in the early 2000s. Chicago Park District Records: Photographs, Special Collections, Chicago Public Library. Architect William Le Baron Jenney (1832 – 1907), who had produced original plans for the West Park System, designed some of the earliest park structures. Known today as “Father of the skyscraper,” Jenney studied architecture, engineering, and landscape design at the École Centrale des Manufactures in Paris. Among his first park buildings was a Garfield Park horse stables with cupolas that rose above the hayloft. (This building was destroyed by fire several years ago). Jenney also designed several park refectories, which were summer buildings for parties and other special events. These included Lincoln Park’s 1882 South Pond Refectory, and a Humboldt Park Refectory, built about a decade later. Neither structure is extant today. 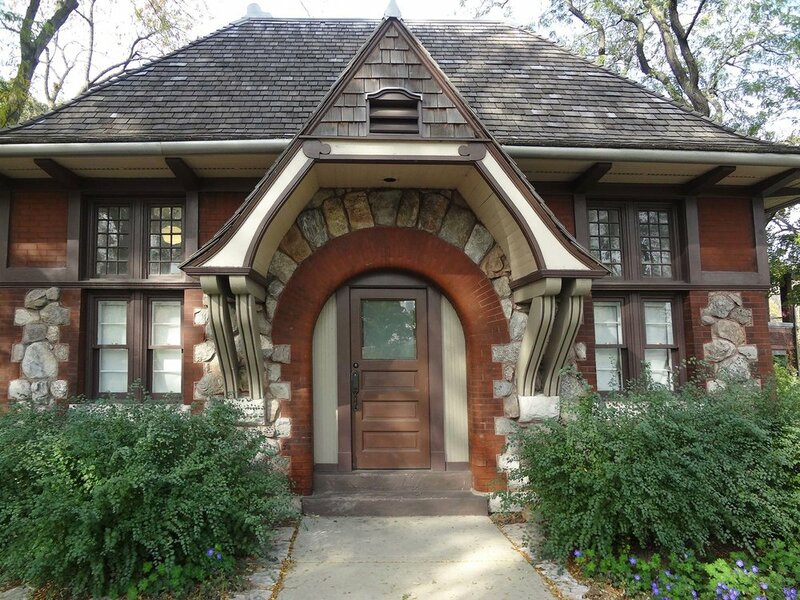 Jenney’s Humboldt Park Refectory was a handsome stone and shingle Queen Anne style structure, ca. 1910. Chicago Park District Records: Photographs, Special Collections, Chicago Public Library. Jenney was not only a talented designer, but he trained and mentored many other noteworthy Chicago architects as well, including Daniel Hudson Burnham (1846 – 1912). At the age of nineteen, Burnham apprenticed under Jenney, and one of his first assignments was to measure and sketch bridges in Lincoln Park. Burnham & Root’s Jackson Park Refectory Building, ca. 1910. Chicago Park District Records: Photographs, Special Collections, Chicago Public Library. In 1876, Burnham married Margaret Sherman, daughter of John Sherman, who was the founder of Chicago’s Union Stock Yards. When John Sherman became a member of the South Park Board of Commissioners, the young firm of Burnham & Root soon received contracts to design bridges and buildings in Jackson and Washington Parks. Burnham & Root’s 1888 Jackson Park Refectory had open loggias that allowed lake breezes to waft through the building. Adapted into the Iowa Pavilion for the 1893 World’s Columbian Exposition, this structure, which remained in the park until the mid-1930s, became known as the Iowa Building. Many late nineteenth century park buildings could be considered expressions of Romantic architecture. When designing these buildings, architects often took inspiration from exotic, faraway, places. 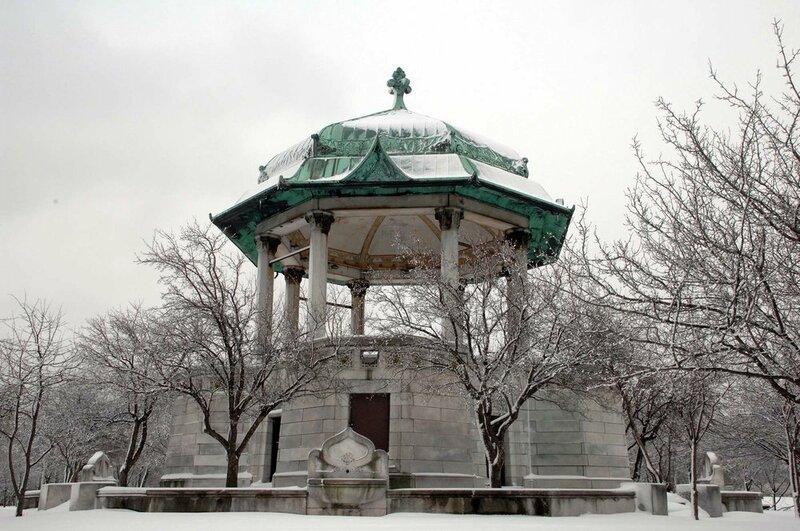 For instance, Joseph Lyman Silsbee rendered his 1895 Garfield Park bandstand in the Saracenic style. Making reference to Islamic architecture, the building has a mosque-like copper dome, with a glimmering intricate mosaic tiles lining its ceiling. D.H. Burnham & Company’s original field houses included this one in Mark White Square. Although this structure was later demolished, a number of the other original Burnham-designed field houses remain today, ca. 1906, Chicago Park District Records: Photographs, Special Collections, Chicago Public Library. 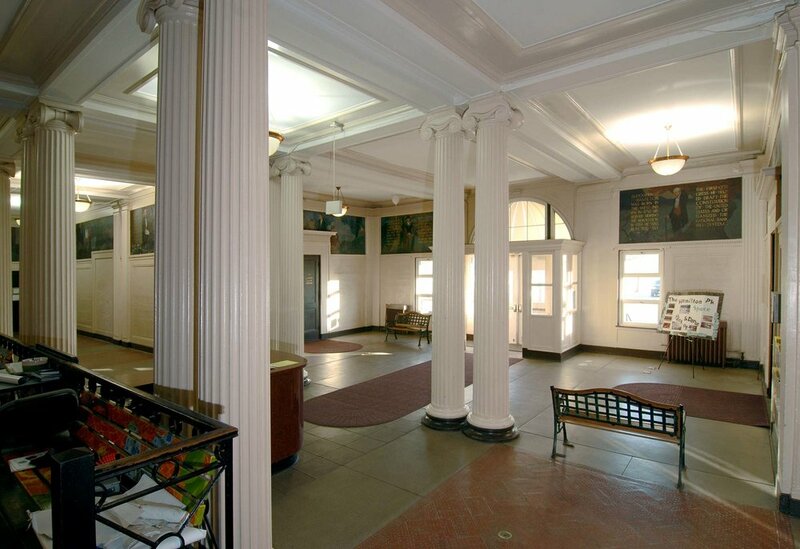 Hamilton Park, one of the original ten D.H. Burnham & Co. field houses, retains its original lobby with paired Ionic columns, 2012, photo by James Iska. Burnham served as chief of construction for the 1893 World’s Columbian Exposition in Jackson Park. Though temporary, the “White City,” a campus of monumental neo-classical buildings with Lake Michigan as a dramatic backdrop, captured the imagination of the city and the entire nation. A decade later, the fair buildings served as an influence when the South Park Commissioners contracted D.H. Burnham & Co. to design all of the architecture for an innovative system of neighborhood parks. These buildings were the world’s first park field houses. Burnham hired Edward H. Bennett, an English born architect who had trained at École des Beaux-Arts, the famous Parisian school that took its inspiration from Classical ancient architecture. Based on the precedent of Chicago’s settlement houses, the pioneering park buildings had gymnasiums, club rooms, auditoriums, cafeterias, and branch libraries. The first ten building complexes were completed in 1905. Providing year-round athletic, recreational, and social services, they were a tremendous asset to the residents of congested tenement neighborhoods on the city’s South Side. Before long, Chicago’s new neighborhood parks influenced the development of field houses throughout the city, the nation, and the world. William Drummond, who worked for several years under architect Frank Lloyd Wright, designed Shedd Park’s field house, ca. 1920. Residents of other Chicago neighborhoods admired the new field houses on the South Side, and wanted similar park buildings in their own neighborhoods. As the field house prototype caught on in the 1910s and 1920s, the city’s numerous park districts of that time hired architects who designed buildings in a range of architectural styles from Prairie School structures, such as William Drummond’s Shedd Park field house to Revival style buildings by Clarence Hatzfeld, including the Indian Boundary, and Jefferson, Paul Revere, and Gompers Park field houses. So, have I piqued your interest in Chicago Parkitecture? I hope you’ll consider registering for the Newberry Library seminar and please help me spread the word!